Here's a selection of our most popular patches. These are available in various styles, finished & sizes, but here are some of our most popular options. We can apply patches to a wide range of garments too, so check over our relabelling page for more info on this service! Our most popular embroidered patch is circular with a merrow border, as in the example photo. But! we can make a whole load of different sizes, shapes & finishes including; glow in the dark thread, metallic thread, square, custom laser cut, iron on backing & velcro backing. 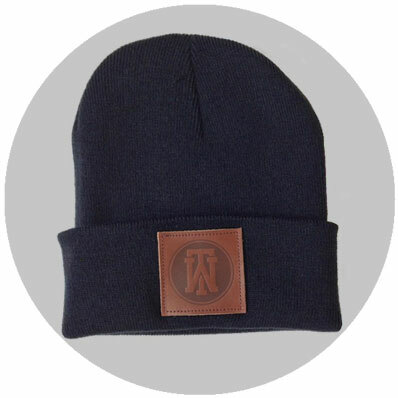 Great for band merch, uniforms, sports kit or pressing onto caps. As well as manufacturing your patches, we can sew or press them on too! 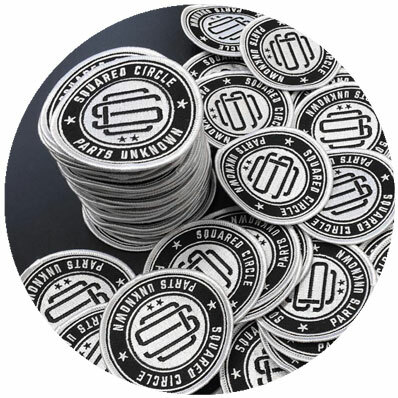 If you'd like a competitive quote, drop us an email with your requirements & we'll be happy to sort that for you.Our minimum order for patches is 100pcs, but if using our relabelling services we can hold any remaining stock for future orders. Woven patches are available in all the same options & finishes as embroidered patches, but they're a good option if your design has a lot of detail, you can weave much finer that you can sew. While embroidered patches have raised thread, woven patches are flat, as the fabric is woven with the design in. Woven patches without a merrow border can be sewn or heat pressed on to most garments, if made with an iron on or felt backing, most popular would be t-shirts, beanies & bags. As well as manufacturing your patches, we can sew or press them on too! If you'd like a quote for woven patches, drop us an email with specifics & we'll fix that up for you. Our minimum order for patches is 100pcs, but if using our relabelling services we can hold any remaining stock for future orders. 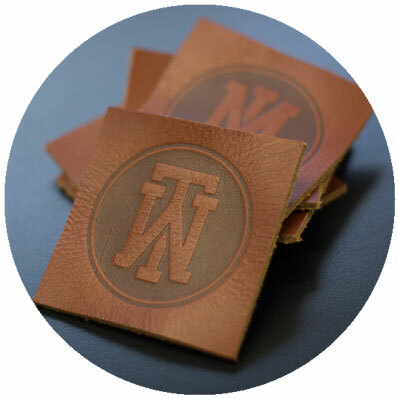 Another option that's pretty popular is leather patches. We often produce these for sewing onto beanies, bags & 5 panel caps, but if you have a particular request let us know & we'll work something out! 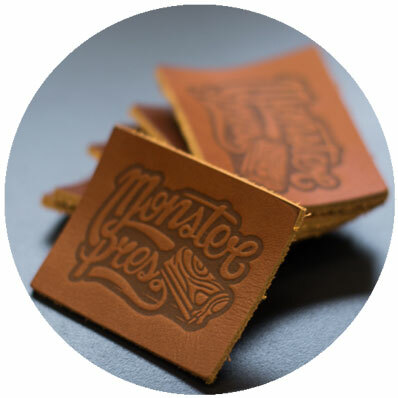 Our most popular option is hot pressed, real leather patches but there are a fair few other options including: faux leather, suede, PU rubber, light, dark, white, metallic, printed, embossed, & distressed. If you have a specific patch style in mind, best thing to do is email through an example photo & we'll see what we can do for you! Our minimum order for patches is 100pcs, but if using our relabelling services we can hold any remaining stock for future orders.